November is the month to collect apples for making cider. 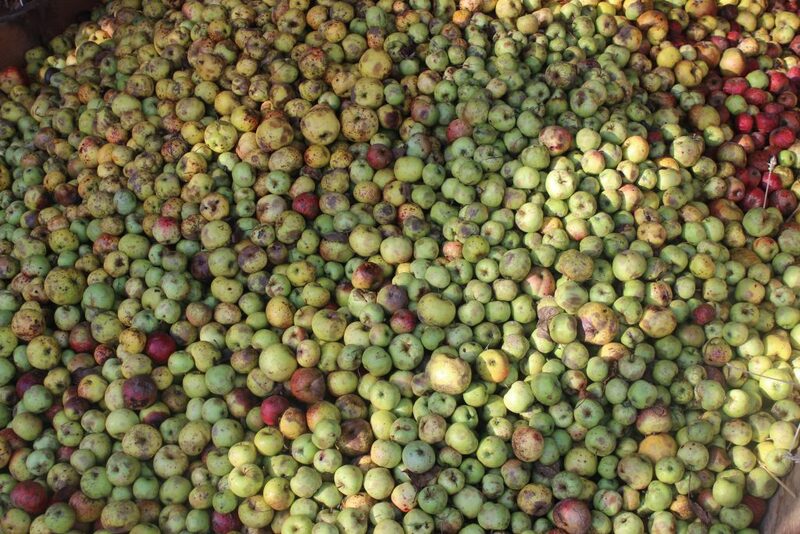 Cider uses apples that are a bit bitterer than eating apples, and should be left for several weeks to become soft before they are crushed and pressed. A common mistake made by newly-installed smallholders is to plant lots of apple trees, all of which yield different varieties of eating apples. In fact, there is a limit to how many eating apples anyone can consume, and two or three good eating-apple trees close to the house should be enough to meet anyone’s needs. These can be supplemented with a few trees, such as Bramleys, that produce apples suited to cooking, and the rest of the apple trees should produce apples for cider making. It takes about twenty, half-hundred weight (25kg) bags of apples to make one barrel of cider (one barrel is 120 litres, 210 pints), which means that you can make productive use of your whole apple crop even if you have planted twenty or thirty trees, and they all have a good year. Apple trees do not do well in shade, and will do better if scattered around the farm in suitable places on the banks around the fields, than if they are all kept together in an orchard. When coppicing a bank, the productive apple trees are left more or less untouched (perhaps they can be given a light pruning), and this helps them to keep ahead of the more vigorous hazels, oaks, etc. that they might be growing amongst.